Every time you drive to Campus Point, you probably don’t even notice this obscure little hill. But before World War II, this lump of dirt was a sizeable island and in ancient times it had a huge, thriving Chumash village on it. The purple line shows the area that was once the Goleta Slough and the “B” denotes the island. Stay on Fairview Avenue past the airport and you go right through the center of what was once Mescaltitlan Island. The first Europeans to see the island were on the Cabrillo Expedition that came through in 1542. The slough was a large bay and thousands of natives were living on the bluffs of the bay and on the 64 acre island, then known as He’lo. Probably the largest single settlement on the California coast. In 1769, the Portola expedition passed through Goleta and the soldiers were impressed by the island in the middle of the lagoon, heavily populated by natives. It reminded them of an Aztec legend that involved a similar island in Nayarit, Mexico called Mexcaltitlan, (seen above). So the soldiers called not only the island Mescaltitlan, but the whole Goleta Valley. Many early Spanish charts label the area as Mescaltitlan. Portola brought with him two Catholic priests who would attempt to map and name portions of the coast for eventual settlement. One of the priests, Juan Crespi, recorded in his journal that they came upon a large estuary that was, “bordered on the north by a good piece of land of moderate extent, entirely isolated. On that island, which is very green and covered with trees, we saw a large town”. The drawing above was made by a sailor named Pantoja, on the Martinez expedition in 1782. Their goal was to choose a site for a presidio, but due to the presence of thousands of Chumash, they decided this was not an ideal location. On Mescaltitlan Island there were actually two large villages. The island was covered in oak trees that produced a multitude of acorns, a staple in the Chumash diet. A wide variety of seafood was readily available and the nearby canyons were full of small game. Additionally, the island was secure from attack by enemies. Father Crespi wrote, “On that island, which is very green and covered with trees, we saw a large town, in which were counted more than a hundred houses”. Over time, the Chumash inhabitants of Mescaltitlan slowly left to become neophytes at the mission or escaped into the back country, where they eventually died of the white man’s diseases. Once the villages were gone, the trees on the island were cut down for firewood and other uses and the cleared land was used as a wheat field for the Spanish ranchos. A series of events in the next century brought some major changes to the slough. The over grazing of cattle on the surrounding foothills was followed by large grass fires, then heavy rains pummeled Goleta in 1861 and 1862, which naturally caused flooding. The abundance of rain caused rapid erosion and sediment poured through the creeks, emptying into the slough. Within a few years, most of the bay that surrounded Mescaltitlan Island became a silt filled salt marsh. In 1876, John More bought the island and surrounding areas, seen on the right above, and used it for a bean field. He later built a house on the island for his sister, Martha Rowe. Around the turn of the century, spending summer vacations on the Goleta Slough was quite popular, as seen in this photo. This is the first known aerial view of the island, taken in 1928. It appears to still be surrounded by water, but the depth was probably quite shallow. In this photo from 1938 the slough surrounding Mescaltitlan appears to be more silt than water. 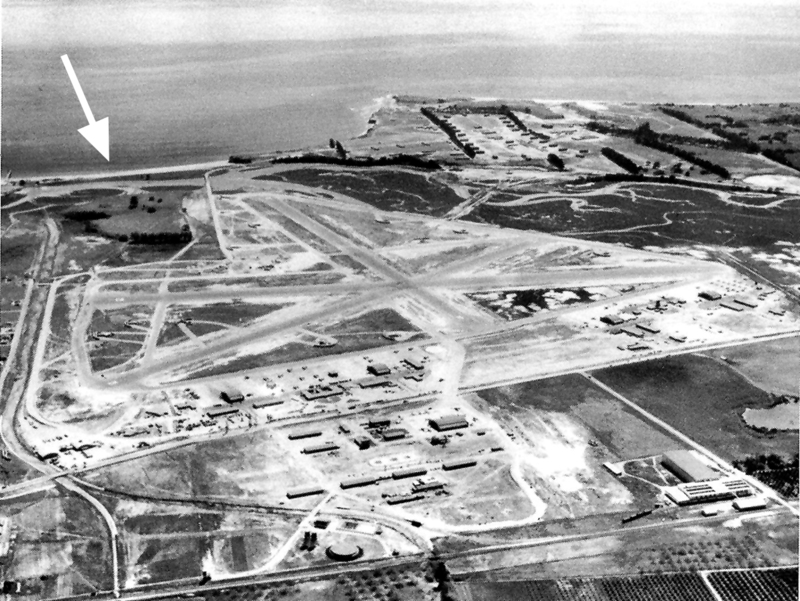 In 1941,the U.S. Government started a program to construct 250 airports across the country and Thomas M. Storke secured Santa Barbara’s enrollment in the program. Mescaltitlan Island was used as fill dirt to transform the slough into more runways. Not surprisingly, construction crews unearthed a large amount of Chumash remains. In 1943, Phil Orr of the Santa Barbara Museum of Natural History found an unusual burial of a woman on the island. She was buried flexed on a large whalebone, heavily decorated with beads and abalone pressed into tar. She was thought to be a person of great importance. Unfortunately, many other valuable artifacts were undoubtedly destroyed in the rush to complete the airport. 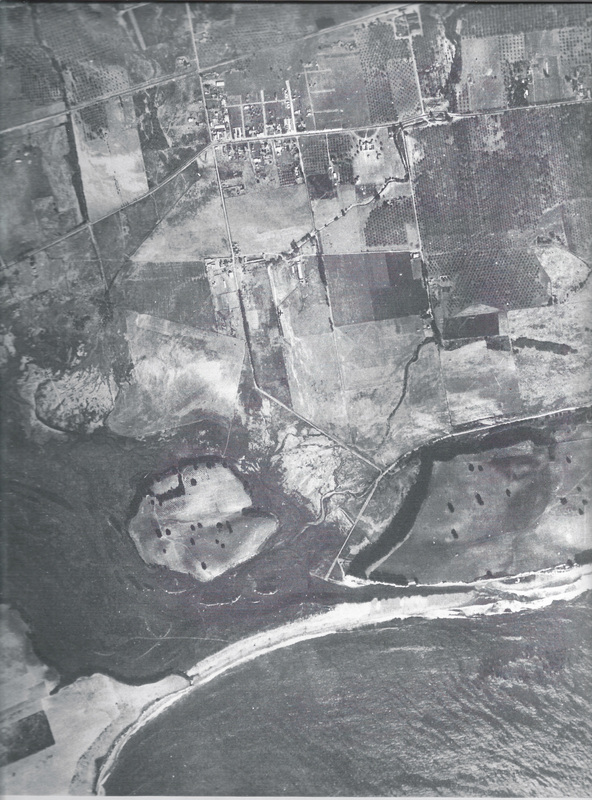 Moffett Place is at the bottom of these photos looking east from 1943, showing a large portion of the island still in existence. 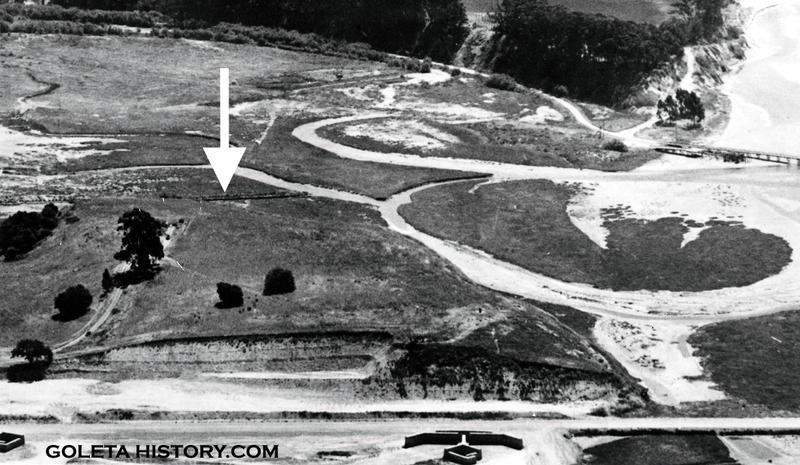 In 1944, a good chunk of Mescaltitlan Island still existed, shown under the arrow. Unfortunately, more of the island was removed for construction of the Ward Memorial Highway in the late 1950’s. Today what’s left of the island is owned by Southern California Gas Company and the Goleta Sanitary District. So the next time you drive past this little mound of dirt, take a longer look and try to imagine how this island looked back in the day, covered with trees and home to a large Chumash population. 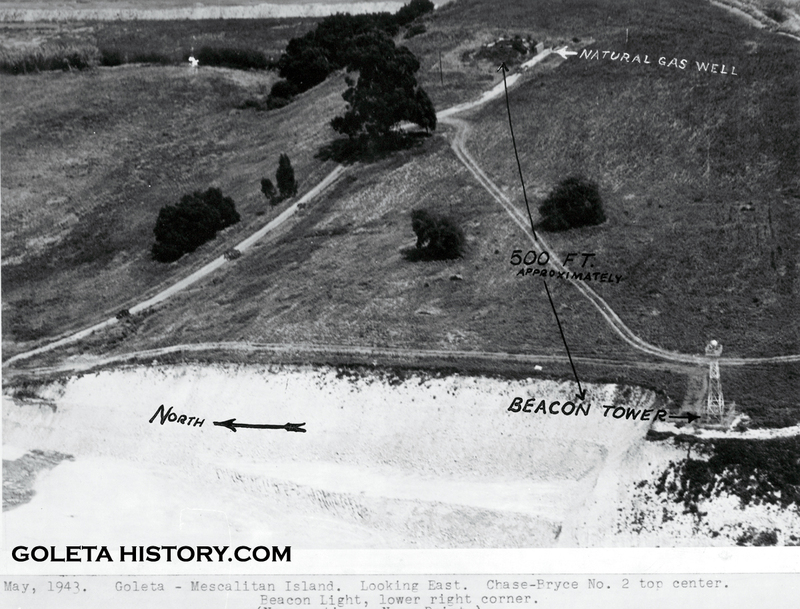 Mescaltitlan was a little island that played a large role in Goleta history. A mural by local artist Larry Maser, depicting a California Condor soaring over Mescaltitlan Island, can be seen at Santa Cruz Market at 5757 Hollister Avenue in Old Town Goleta. Your history of Mescaltitlan Island was a wonderful and informative read. I’ve always been drawn to it since moving here in 1989. The storyboards at the little parking lot across the road from there has a nice concise history as well. I live in the mobile home park that’s located in what was the old slough. Rancho Goleta – I understand Fess Parker developed this and opened it in 1973. Wondering if you could fill in some of that history. How did Fess come to own it? How long a process did he have to go through to get the project approved? Looks like the property might have been farm land – who owned it? THX!